Memorable Wedding: Lily Wedding Bouquets: Could the Peruvian Lily Be Perfect for Your Wedding? Lily Wedding Bouquets: Could the Peruvian Lily Be Perfect for Your Wedding? 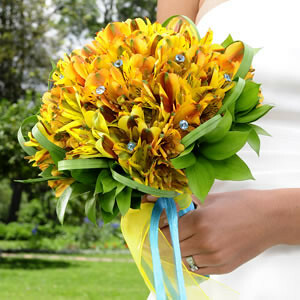 Peruvian Lilies, also known as Alstroemeria lilies, make beautiful and cheerful lily wedding bouquets. Though they are not the most popular wedding lilies, that role being assumed by calla lilies, Casablanca and stargazer lilies, the Peruvian lilies are the most economical and smartest choice by far. This article will attempt to convince you of the virtues of this sweet flower and the reasons why this type of lily could be the perfect flower for your wedding. The Peruvian Lily comes in many colors to match most wedding themes. White, yellow, orange, red, purple, light pink and hot pink are the main colors of these flowers although most colors are streaked or freckled with contrasting colors or stripes. Although flowers are a natural product and colors are not as specific as if you were to buy artificial flowers, when you choose a pink Alstromeria lily as your wedding flower, the variance in shades in each flower will be a masterpiece since nature doesn`t make flowers that don`t match. If you are an artistic type of person, you will appreciate the intricate patterns featured on each and every flower of this lily. 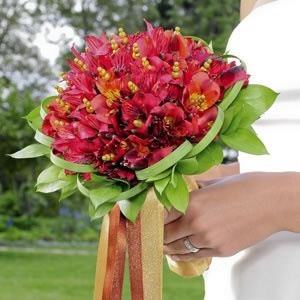 The meaning of the Alstromeria Lily is ideally suited for weddings. This lily stands for lasting friendship and eternal love. What a wonderful combination for a long lasting wedding! If you believe in the symbolism of flowers, you will be relieved to find out that these lilies attract good fortune, prosperity and wealth to newlyweds. This flower is your top bet for creating an unbreakable bond through life`s ups and downs. And if you don`t believe in symbolism, why take a chance on such an important occasion in your life. By choosing an ally like the Peruvian lily, all the odds of wedding bliss will be placed on your side. 1) This is a very cheerful and happy flower. 2) It is lightly fragrant. Sweet without being overpowering. 3) Not too formal, it is elegant yet fun-loving. 4) Economical without looking cheap. 5) Versatile. Can use in bouquets to corsages and everything in between. 6) Pretty without being a show off. Simply beautiful. 7) There are multiple blooms on each stem. 9) Long lasting flower that won`t easily wilt. 10) Tall stems can be used in tall arrangements. Are you convinced yet? For a simply elegant wedding floral theme, choose the Peruvian lily, stand back and enjoy the compliments you will no doubt receive. 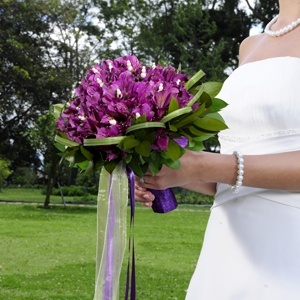 Bella Wedding Flowers has the best selection of wedding arrangements with Peruvian Lilies. From bride`s bouquets and bridesmaids bouquets to centerpieces, boutonnieres and corsages, you can order each item individually on Bella`s website or simply order a wedding in a box. Wedding in a boxes are complete sets of flower arrangements most requested for weddings.